Reserve Bank of Zimbabwe governor: New note issued ahead of "festive season"
HARARE, Zimbabwe (CNN) -- Zimbabwe's central bank introduced a $10 billion note worth less than 20 U.S. dollars, as the once-prosperous southern African nation battles against spiraling hyperinflation. The new note, expected to buy just 20 loaves of bread, comes just a week after Zimbabwe issued a $500 million note to ease a cash shortage. Reserve Bank of Zimbabwe Governor Gideon Gono said the $10 billion note was being introduced for the "convenience of the public ahead of the festive season." On Thursday, the U.S. dollar traded for about 600 million Zimbabwe dollars, and the hyperinflation was expected to continue. People slept overnight at the bank doors, hoping to get money for the next day. President Robert Mugabe apologized to his ZANU-PF party supporters Thursday for the problems Zimbabweans were facing but insisted his nation has turned a corner in its fight against its worst humanitarian crisis, the state-owned Herald newspaper reported. Shortages of most essentials such as electricity, fuel, medicine and food have become a common feature in Zimbabwe, forcing people to flee the country. Zimbabwe has slashed zeros from the amount of its worthless currency during the past two years -- the latest being 10 zeros in August. Once one of Africa's most promising economies, Zimbabwe is reeling under its worst humanitarian and economic crisis. A cholera outbreak has killed more than 1,000 Zimbabweans since August, forcing hundreds to cross the border into South Africa and Botswana to seek treatment. Five million people are in need of food aid in a nation that once exported food to its neighbors, the United Nations says. But Mugabe -- blamed for the crisis by his critics -- said the worst was over. He said he was optimistic about resuscitating the power-sharing deal he signed with opposition leader Morgan Tsvangirai in September, the Herald reported. "We will be inviting the two leaders -- Mr. Morgan Tsvangirai and Professor Arthur Mutambara -- to come and discuss the way forward," Mugabe said. The deal has yet to take effect, as Tsvangirai blamed Mugabe for grabbing all key ministries such as home affairs, local government, finance, home affairs, information and defense. 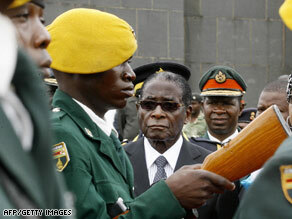 Mugabe said Western nations and neighboring Botswana were against the formation of an inclusive government in Zimbabwe. "I was reading recent utterances by Condoleezza Rice that African leaders are not prepared to topple President Mugabe and bring about regime change," he said. "She condemned this inability on the part of African leaders. How could African leaders ever topple Robert Mugabe, organize an army to come? It is not easy. I do not know of any African country that is brave enough to do that. "Botswana is making some stupid noises. They are just hollow noises to assure the MDC that the Botswana government supports it and also in response to Britain and America that Botswana is a good mouthpiece of the white men." The MDC is Tsvangirai's opposition party -- Movement for Democratic Change. On cholera, Mugabe said the country was failing to import adequate water treating chemicals because of the sanctions imposed by the west.